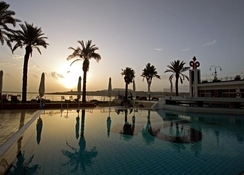 Qawra Palace Hotel in Malta is 4-star family-run hotel located in the beautiful St Paul’s Bay. Seated by the Salina Bay, the Qawra Palace enjoys a seafront location amidst beach views and cityscapes. This Malta holiday heaven boasts 392 elegantly furnished rooms for its guests. All of these rooms come with spectacular views of Salina Bay and the promenade facilitate modern amenities that will pamper your stay. The hotel’s central location helps you explore beautiful beaches, indulge in numerous water sports and shop from the nearby shopping complexes. 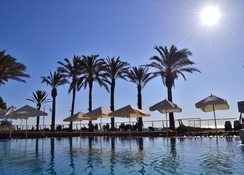 Perfect for couples and families, Qawra Palace Hotel boasts a fabulous dining, night time entertainment, nearby casino, tennis court, mini golf, spa, Jacuzzi and swimming pools. You can also take a tour of Bugibba and St. Paul’s Bay that are just a stone’s throw away from the hotel. St. Paul’s Island is also a short boat ride away. 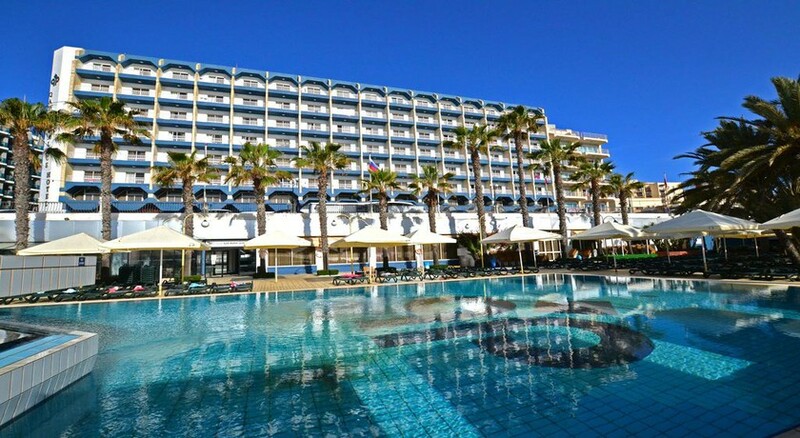 This hotel is located right on the sea promenade where you can see Salina Bay in front of you and the beach across the road. The town centre of the beautiful Qawra resort is about 600 metres away with many shops and restaurants, bars and cafes, and nightclubs. Bugibba (2 km) is another town in the vicinity that can be approached for shopping and nightclubs. The international airport of Malta is situated about 17 km away from Qawra Palace. There are total 392 guestrooms spread over eight floors and divided into four different types; sea view rooms, side sea view rooms, inland rooms and family rooms. As the name implies, family rooms are designed specifically for families with children and have extra beds. The rooms look out to views of Salina Bay and an inner courtyard depending on their location. All guestrooms are decorated with modern furnishings and provide a comfortable stay with amenities like telephone, air conditioning, mini fridge, coffeemaker, in-room safe box and an en suite with bathing facilities and hairdryer. The food is served buffet style at the main restaurant, which displays a large variety of items for breakfast, lunch and dinner. For some pizzas and pastas, you can head up to Qawra Palace Pizzeria. There are a few cafes and bars serving large selection of beverages – both alcoholic and non-alcoholic – along with light snacks. Lounge bar is an apt place for before and after dinner drinks; Coconut Grove serves beverages with snacks; Caffé Royale is the place where you can get delicious Italian coffee with homemade cakes, pastries and other snacks; Gelateria offers variety of ice creams with tasty sorbets. There are numerous outdoor and indoor activities available on site and nearby the hotel. 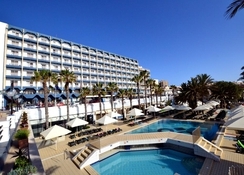 The outdoor swimming pool is covered with sunbeds and parasols, while the indoor pool is temperature-controlled. Jacuzzi, spa and massage can also be availed with a myriad of treatments and massage therapies. Flood-lit tennis court, mini golf, games room, hairdresser, and gift and accessories shops are the other facilities you can enjoy within the premises. Once you hit the beach, there are various water sports such as diving, snorkelling, paragliding, jet skiing etc. available at an extra cost. The animation team organises daily entertainment programs for guests of all ages. The tennis court and the car park are no longer available. Nice hotel room , lovely food . Excellent service . The only thing that could be improved was the entertainment . Lovely food, friendly staff, very clean and great entertainment. I cant wait to go back there. Me and my wife both had a great time away, everything was made easy and the staff at the hotel were very helpful. Very good holiday in October 2018. I would recommend a sea view room for anyone booking as the views are beautiful.